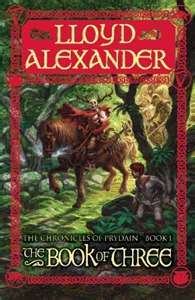 Though I have heard of the Chronicles of Prydain, and over the years have even gleaned some knowledge of Taran, Assistant Pig-Keeper, and Hen Wen, his oracular sow, I’ve never had occasion to delve into the series until this winter. I was hugely impressed. The prose is gorgeous, the characters unique and well-developed and the story full of substance. Not to mention there are four more books in the series, which I can’t wait to lay my hands on. The Book of Three focuses primarily on an impatient, impulsive young boy with dreams of heroism. But when the evil Horned King rises against the Sons of Don and Taran is thrust into a role of danger, the boy finds the responsibility more than he bargained for. “In Caer Dallben, he had dreamed of being a hero. But dreaming, he had come to learn, was easy, and at Caer Dallben no lives depended on his judgment.” I loved watching the growth and maturity of this peasant child with a noble heart. But many other characters give the tale variety and depth. Eilonwy (eye-LAHN-wee) (There is a pronunciation guide at the end of the Kindle edition which, unfortunately, I didn’t find till the end.) is a sharp-tongued but good-hearted girl who continually butts heads with Taran. Their spoken exchanges provoke a good many smiles. Fflewddur Fflam, a minor king-turned-bard, possesses a habit of exaggeration and a harp that snaps a string whenever he lies too boldly. Gurgi, an ever-hungry nuisance of a man/beast “would love to be wicked and terrifying, though he cannot quite manage it.” And the dwarf Doli is forever holding his breath in an unsuccessful bid to turn invisible. Together, this unlikely bunch must rescue Prydain from the evil that seeks to destroy it. Aren’t these fabulous?! Talk about substance. Not only is the story entertaining, it’s a thought-provoker. Like most fantasies, The Book of Three contains lots of strange names, of both places and characters. The particular spelling Mr. Lloyd employs, that of replacing short “i” sounds with a “y”, gives the story a certain continuity and mystical feel, but it does make for some confusion. Names like Gwyn, Gwydion, and Drynwyn begin to run together. I’d suggest jotting them down as you go. This helped me tremendously. Nevertheless, The Book of Three rated easily among my recent favorites, and depending on the rest of the volumes, the series could rank among my all-timers. Since book two took Newbery honors, and book five took the medal outright, I’d say chances are good. Highly, highly recommend for kids age 8 and up.